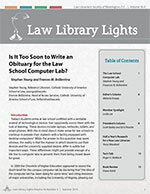 Law Library Lights is a quarterly newsletter with articles on contemporary topics of interest to legal information professionals. Produced by the LLSDC Legislative Research Special Interest Section, the Legislative Source Book contains a collection of resources to help with complex historical and contemporary questions in legislative activities. The Mentoring & Volunteering Committee helps initiate a relationship between veteran and newer members of the Society as a gateway to professional development. The committee also helps assign interested volunteers with our various committees, SISs and special projects.